North and South Korea reached a historic peace deal this week, and as the leaders from the two nations met in person for the first time and agreed to pursue an end to the Korean War, it signaled an incredible breakthrough in diplomacy and sent the stocks of defense contractors in the United States crashing. When North Korea’s Kim Jong-un shook hands with South Korea’s Moon Jae-in for the first time on Friday, they put thousands of people both at home and around the world at ease, as they agreed to a peace deal that has the power to break the tension that has been between the two countries for decades. However, while peace may seem like the best possible outcome to the average person who is aware of how the ongoing war has hurt both North and South Korea over the years, it is a resolution that hurts the United States military-industrial complex, as can be seen by the results from stocks following the meeting. On Friday alone, the five largest defense contractors in the U.S. lost more than $10 billion in value. 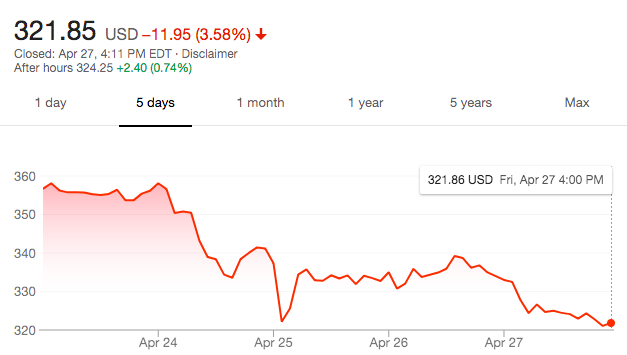 Lockheed Martin (LMT) started the week at $352.79 per share and ended it at $321.95 per share, falling 2.5 percent to a valuation of about $92 billion. 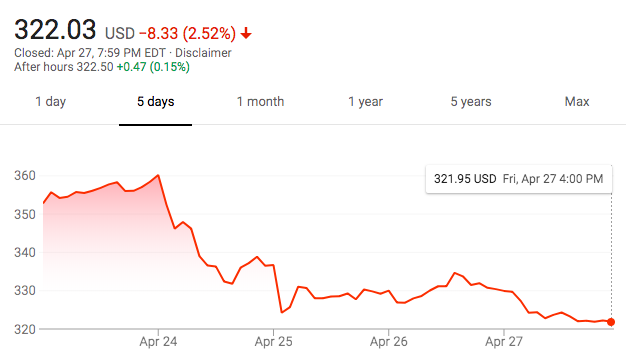 Northrop Grumman (NOC) started the week at $356.67 per share and ended it at $321.86 per share, falling 3.4 percent to a valuation of $56 billion. 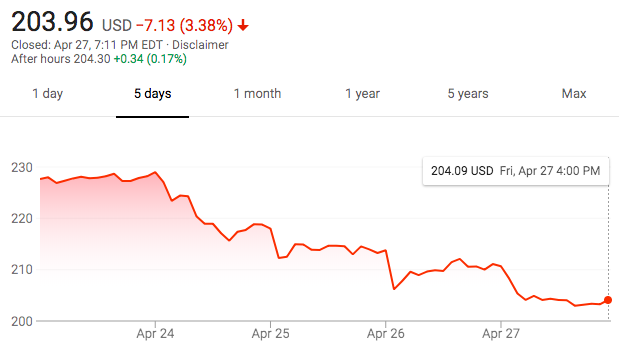 General Dynamics (GD) started the week at $222.92 per share and ended it at $203.70 per share, falling 3.8 percent to a valuation of $60 billion. 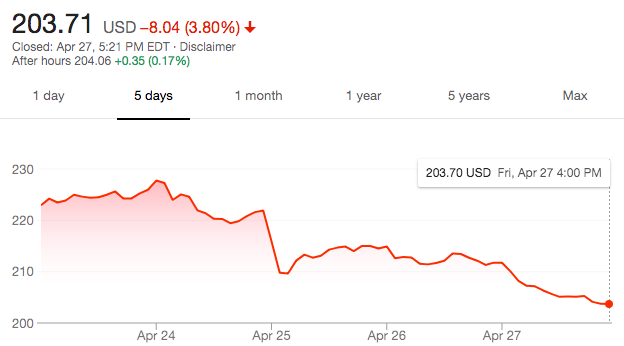 Raytheon (RTN) started the week at $227.67 per share and ended it at $204.09 per share, falling $3.6 percent to a valuation of $50 billion. Boeing (BA) lost less than 1 percent of its stock, ending the week with an evaluation of $200 billion. When the United States invades sovereign nations, overthrows foreign governments and launches countless drone strikes that kill innocent civilians, the military-industrial complex profits by the billions. But the industry is so volatile that while a peaceful meeting between two leaders can send its stocks crashing, threats and angry Tweets from another leader can cause its stocks to soar. The United State government accounted for around 70 percent of Lockheed Martin’s revenue in 2016, and when the Trump Administration began threatening to launch a full-scale war against North Korea, the company’s shares skyrocketed by 8 percent, marking a 20 percent increase in Lockheed Martin’s stock in the first 8 months of the year. Now that lasting peace could be on the horizon between North and Korea and stocks are dropping, it raises questions about how defense contractors in the U.S. will recover. If there is no bear to poke and no war to threaten in North Korea, will the U.S. increase tensions in Syria, at the risk of provoking Russia? Or will it resume its propaganda campaign against Iran in an attempt to convince Americans that the country is in desperate need of “freedom and democracy,” when in reality the military-industrial complex is in dire need of high stocks and successful profits?